Erie Harlem Station: First Time Here? Back in November 2010, I was starting to reshape completely my approach to this hobby and layout design thanks to Lance Mindheim and Trevor Marshall’s work. Their philosophy about achievable layouts rang a bell with my decade-long frustration. The lack of "space" seemed to spell the end of all my efforts. But still, some day I simply googled “mini train layout” and discovered Carl Arendt’s seminal Micro Layouts website. While Carl’s website was full of cute layouts at first glance, his core message that small layout should have a purpose kept me reading. Among the more prototypical examples was a certain Jack Trollope’s attempt at reproducing a simplified version of Erie’s Harlem Station. In a matter of a few days, I was mocking up a full scale rendition of the station and Carl Arendt kindly published my project on his scrapbook page 103a on November 15th, 2010, which featured the now famous ChicagO Fork O scale layout by well-respected Australian modeller Prof Klyzlr. The rest was history… unfortunately, Carl left us before he could see the completed project. 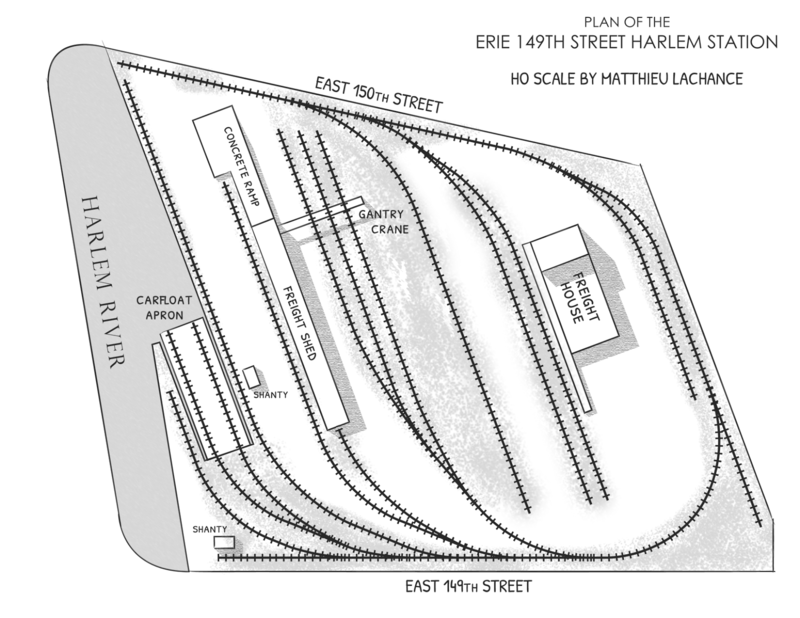 Why Erie Railroad's 149th Street Harlem Station? “Because it's small, easy to build and a great little prototype that begs to be modelled.“ I once used this sentence to describe Temiscouata Railway’s Connors Station. I must admit it fits Harlem Station perfectly. It should be noted the most interesting feature about Harlem Station is that it can be fully modelled in HO scale without any compression on a compact island layout (less than 5 feet x 7 feet) which is ideal for a house devoid of wall space for a shelf layout. While small, it can hold up to 55 cars and includes its own staging yard in the form of a carfloat. 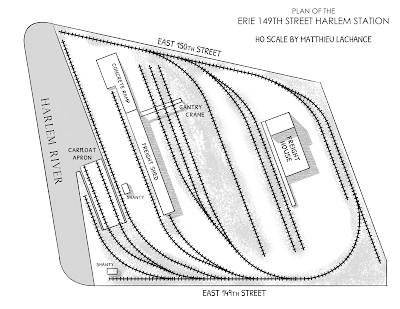 This idea has already been exploited by Tim Warris with his CNJ Bronx Terminal, however, Harlem Station is more achieveable for the casual modeller since it doesn’t require intricate trackwork. No wonder this particular prototype is now replicated by many other enthusiasts. Harlem Station is the epitome of steam-diesel transition era; American railroading in a nutshell. Without freelancing, you have AGEIR boxcab locomotives, gantry crane, LCL traffic, carfloats, attractive 1950s vehicles and a vast selection of classic railcars from every parts of North America, from ATSF to B&O. Simple as can be… a prime example of real railroads pragmatism over modeller’s licence. Having had the occasion to operate the layout a few time, I can tell it can quickly become quite a feat to manage. Harlem Station isn’t about the extraordinary, but about the mundane… which makes it an exceptional prototype to model.